Top ten: idiotic posts recently read on the "big boards"
I'm not sure what Jim was thinking. I know this much for sure: he was excited that the Giants were in the playoffs, and he really really wanted some dirty water dogs for his party. Sounds like a pretty fool-proof plan to execute, right? I mean, you got the Giants in the playoffs, you got a bunch of beersh, you got you a boatload of Sabretts (skinless, although I complained and instructed otherwise). Seems like a perfect night. One that could run on autopilot. But something went wrong. Horribly, horribly wrong. It seems that Jim, overwhelmed with excitement, decided that he should boil the effing dogs. Not simmer. Not warm up. 100%, 212 degree, rolling boil, for God knows how long. They tasted as mushy as they look. All gray and split open and broken up and just nasty Jim. Like soft sticks of baby food that you would never want to feed to a baby. What happened next was even better. Jim had to drive to about 3 different stores to try to find skin-on dogs (on my insistence). He came back with some sort of brand, which we figured we'd settle on. I opened the package and was essentially slimed. 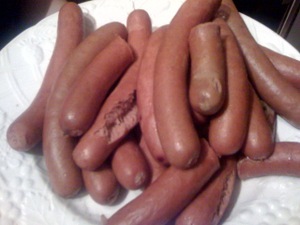 There was a mucus-y substance coating the hot dogs. I've never seen anything quite like it. I didn't take a picture of them, and I sure as hell didn't eat them (although I will admit, I did consider just throwing them in the water to put an end to the madness...what's a little slime among friends). In they went into the bin, out the door went Jim, for round 3. He eventually came back with some kind of ghetto dog (Wallington, while probably having more sausages per capita than any other town outside of Poland, apparently doesn't have many hot dogs). Ball Park Franks [*shudder*] or some such nonsense. But at this point he was about 40 dollars deep in dogs, running out of patience, and kickoff was imminent. We heated them gently in the water this time, and everything was right in the world once again. The bright side? The water in the pot had essentially turned into hot dog stock during the first failed procedure. I can't help but think that added a nice flavor when we simmered the final batch. Maybe we'll add a bay leaf next time. Perhaps a bouquet garni. Hopefully Jim's new Weber will be assembled by next year's playoffs.